A lot of people don't take business continuity initiatives seriously. But when a polar vortex in the US, a blizzard in the UK, and a heat wave in Australia all happen almost simultaneously AND cause massive disruptions to business operations, the importance of business continuity suddenly gets the attention it deserves. The 1st quarter of 2019 has been pretty chaotic. A polar vortex swept through the American Midwest and Northeast, while an intense blizzard buried parts of UK in 6 inches of snow. But as those parts of the world dropped to critical subzero temperatures, a record-breaking heat wave also scorched most of Australia. These three extreme weather events caused major disruptions in their respective regions. In the US and the UK, black ice and thick layers of snow rendered roads hazardous and, in some places, even impassable. Runways and railways that were covered in several inches of snow also became unusable, forcing airports and railway stations to cancel trips. Several schools also closed. In Australia, people were advised to stay indoors to avoid the dangerous heat. Temperatures got so hot in certain places, that some bitumen pavements started melting, interrupting motorists, who were advised to slow down on the affected roads. These extreme weather conditions and the ensuing disruptions aren't totally unexpected. In fact, the World Economic Forum's Global Risks Report 2018 had already identified extreme weather events and natural disasters as the top two risks with the highest likelihood of occurrence. Extreme weather conditions can adversely impact economic activity because, if the conditions become so severe, people can be forced to stay at home. Not only would this result in lower consumer spending, it would also prevent employees from reporting to work. Fortunately, the advent of new technologies and better WAN/Internet connections can now minimize the impact of these disruptions. Online stores can enable certain businesses to continue accepting orders; cloud computing and desktop virtualization technologies can enable employees to continue performing office work; and business process automation solutions can enable companies to continue carrying out internal processes and B2B transactions. But while these business enablers are now readily available, it can also be a challenge to pick the right solution for the job. Although they work behind the scenes, internal processes and B2B transactions are vital to business productivity and growth. They too can suffer during extreme weather events, especially if majority of these processes rely heavily on human intervention. 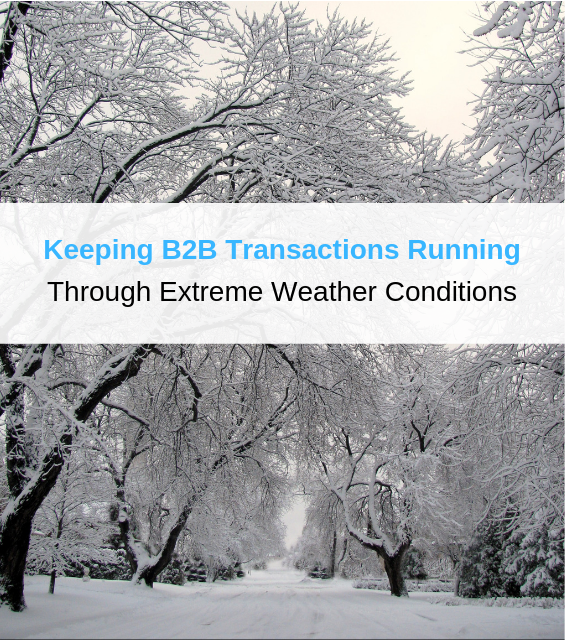 So, the more processes you can automate, the less affected your business will be if a major weather event strikes. But how exactly do you automate business processes? Ideally, you would want a solution that simplifies the automation process itself. A lot of the solutions out there rely heavily on script writing, an already painstaking method that's also hard to document, manage and troubleshoot. What you want is a solution that will allow you to automate processes with simple point-and-click procedures and, when something goes wrong, troubleshoot issues even if you have very little or even zero coding skills. Secondly, you will want that solution to support remote administration. That way, should a strong hurricane or blizzard prevent your server admin from going on site to troubleshoot the issue and perhaps make necessary changes to the settings, he/she can still perform his/her job from home. One solution that has these attributes is JSCAPE MFT Server, a multi-protocol, platform-independent managed file transfer solution that features an easy-to-use, GUI-based automation-enabling tool. Companies who have tried MFT Server have used it to automate thousands of business processes. For examples of some of the workflows you can automate using MFT Server, read through our large collection of articles on triggers. You can try those examples out by downloading a free, fully-functional Starter Edition of JSCAPE MFT Server.